Planning a wedding can be tricky, but it doesn't have to be. All you need to do is stay focused and be organized. Here are a few wedding tips and ideas to inspire you as you plan your special day. The Giftypedia's mission is to be your guide to great gift giving. We've assembled many topical gifting guides ranging from over 1,000 holidays to weddings, graduations, international customs and even superstitions. 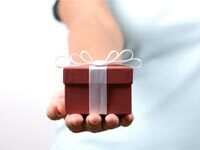 Our goal is to bring you creative gift giving thoughts as well as helpful etiquette, advice and ideas. Our site's articles are written to give you a gifty edge. This page was last modified on 8 October 2014, at 09:11. This page has been accessed 1,891,472 times.